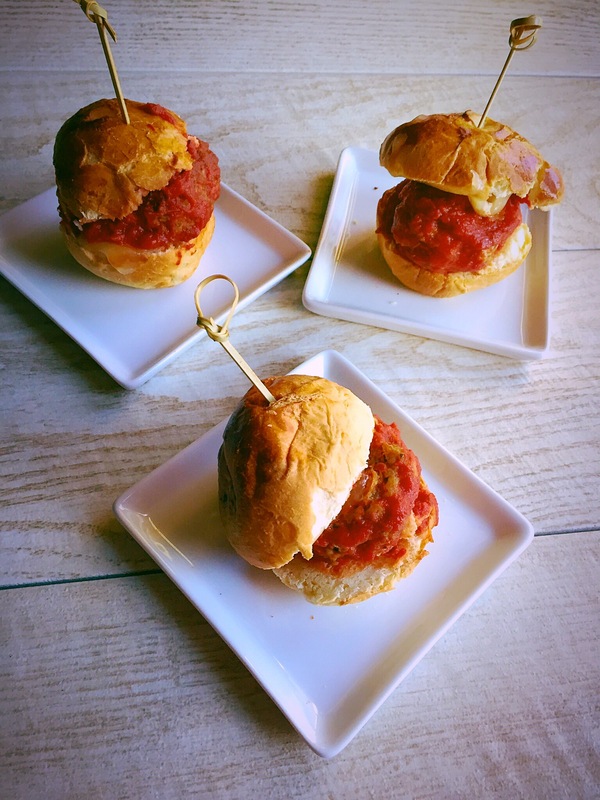 These sliders are the perfect addition to any party. People will not feel guilty eating a few because they are so adorable. Although they are a small bite, they are packed with strong and delicious Italian flavours. In a saute pan, heat the olive oil over medium high heat. Add the onions and saute until translucent, about 5 minutes. Add the garlic and saute for 30 seconds, until fragrant. Leave to cool for a couple of minutes. Prepare two sheet pans covered with parchment paper. To make the meatballs, combine the remaining ingredients and cooled onions and garlic into a large bowl, careful not to over mix. Roll the mixture into 24 meatballs. You will likely have extra. Place the meatballs onto sheet pans. Place the meatballs in the oven and bake until dark brown on the outside and cooked through in the middle, about 30-40 minutes depending on the size. Heat the tomato sauce in a large pot over medium heat. When the meatballs are ready add them to the sauce ensuring the sauce coats the balls. Meanwhile, combine the garlic, butter, and a pinch of salt and pepper. On two baking sheets, line up the sliced slider buns. Coat the bottom half of the bun with butter and the other half with half a slice of cheese. Toast the buns until they are lightly golden and the cheese has melted. To make the sandwiches, scoop a meatball coated in sauce on top of the garlic butter toasted half of the bun and top with the provolone covered half. Serve and enjoy! Feel free to swap the Romano or provolone cheese in this recipe for other Italian favourites like parmesan or mozzarella.